On the evening of February 4th, 2017, around 1,800 devotees, friends and well-wishers of Paramahansa Yogananda and Yogoda Satsanga Society of India (YSS) and members of the public converged at Raghavendra Mandapam in Kodambakkam, Chennai, for the release of Divine Romance in the Tamil language. The book launch ceremony was held as part of the centenary celebrations of YSS, which was founded in 1917 by Sri Sri Paramahansa Yogananda. The book titled ‘Deiveega Kadhal’, is the Tamil version of ‘The Divine Romance’. It is the second book in a trilogy of talks and essays by Paramahansa Yogananda centered on the romance of the soul seeking union with Spirit. Noted cine actor, Padma Vibhusan recipient and, YSS Kriyaban, Rajinikanth was the Chief Guest. As a preamble to the program, devotees sang Cosmic Chants and bhajans welcoming attendees into the hall. The main hall was filled to capacity with over 800 people comprised of dignitaries, members of the public and devotees from far and near. Special vantage points were provided in the hall for over 70 members of media and the press in attendance. About 600 attendees were accommodated in two adjacent overflow halls with connected large-screen televisions and audio to view the proceedings transmitted live. Multiple areas were equipped within the venue for sale of books to handle the demand from attendees. The program began at 6pm. By way of information the Master of Ceremonies (MC) spoke about how Paramahansa Yogananda’s chants become spiritualized when sung repeatedly with ever-increasing devotion to elicit a response from God. The Chief guest, Sri Rajinikanth, and YSS Swami’s Smaranananda and Suddhananda were invited to light the welcome lamp and then took their seats on the dais. A short invocation and prayer song was performed by a devotee. The MC welcomed the audience, following which the Chief Guest and Swamijis were each garlanded by senior members of the Chennai Kendra. A brief introduction was then shared about each of the dignitaries on the dais with the audience. Next a short video show on the history of YSS and its current scope, breadth and reach was shown to the attentive audience. 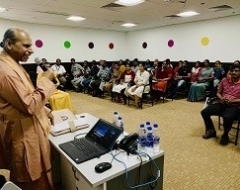 YSS Treasurer, Swami Suddhananda Giri was invited to speak about the Centenary year of YSS. He spoke about how Sri Sri Paramahansa Yogananda established YSS in 1917 as a how-to-live school in a small hut in Dihika, a village in West Bengal, with just seven students. And now a century later, YSS has grown to include 4 ashrams located in Ranchi, Dakshineswar (its registered office), Noida and Dwarahat (near Ranikhet in the Himalayas), and over 200 meditation centers spread across India. YSS also runs 20 educational institutions from primary level to the graduate level. Swamiji also covered some of the humanitarian work performed by YSS of serving humanity as one’s larger self. 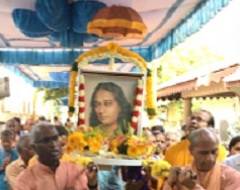 He also spoke about the YSS lessons authored by Paramahansa Yogananda and that is availability to all sincere seekers at nominal cost to cover printing and postage. 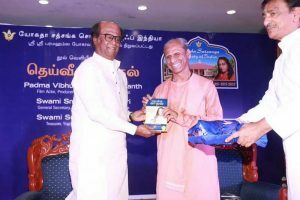 The Chief Guest, Sri Rajinikanth, then released ‘Deiveega Kadhal’ (The Divine Romance) to wide coverage by print, TV and online media personnel in attendance. The Chief Guest, Sri Rajinikanth, was then requested to address the audience. He said asking questions about the purpose of one’s existence is rare. Some seek further by reading books or going to teachers. It is rarer still to find a Guru and obtain his guidance. He urged those assembled as privileged to get all these and requested they not waste these rare blessings. He said he was proud to say “I am a spiritual person who values spirituality more than money, name or fame”. He then talked about his search through many teachers leading him finally to Sri Sri Paramahansa Yogananda and his lineage. He read the Autobiography of a Yogi in 1998. When he read the book he was strongly inclined to produce a film about Mahaavatar Babaji to the general public. He then obtained Kriya yoga Diksha from YSS and said its regular, devoted practice changed his life. Rajinikanth said “The book Divine Romance is the first book that I am releasing in my lifetime”. Of the book, he observed “Divine Romance speaks about the divine love between you (the soul) and God. 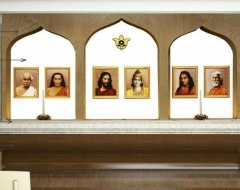 While reviewing the book, I soon realized that every page, nay every line, is filled with gems of Paramahansa Yogananda’s love and wisdom.” He said “I am privileged to release this wonderful book in the presence of all of you.” He concluded his address by praying for the Gurus to bless all those present. His address was received with thunderous applause. The program ended with a vote of thanks by a senior member of Chennai Kendra. Many members of the public and devotees expressed their gladness and delight with the scale and grandeur of the event. Aorund 500 copies of the Divine Romance (Tamil) were sold shortly after the event. The event was widely covered by the press in print, TV and online medial channels. Around 40 people signed up for the lessons at the venue. They were asked to come the next day (Feb 5th) to the Chennai Kendra for an Open House which was conducted by Swami Pavitrananda. 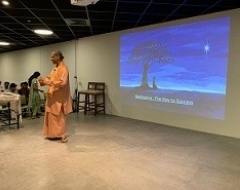 Around 45 people attended the event where Swamiji conducted a guided meditation and explained the Hong Sau technique. Later that afternoon, a separate group of eligible devotees were initiated into higher Kriya by Swami Smaranananda.